manoeuvring in tight driving and parking situations. A new signature damson purple colour, with chrome accents, new sporty interiors with new fabrics and stunning in-car features, make the Nano Twist an exciting car to drive. "Since its inception, the Nano has been a path-breaking invention and has been constantly developed to provide class-leading value, with our core philosophy of anticipating customers' needs. Blending best-in-class technology and design engineering, we at Tata Motors have worked closely with our partners to take awesomeness to a whole new level with the Nano Twist. The Nano Twist will redefine customer's driving experience in city traffic with the EPAS. It comes loaded with trendy features, exciting new colour and sporty interiors, which makes it a cool, smart city car to hang-out with. 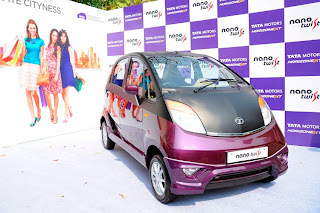 Tata Motors will continuously innovate on the Nano platform, catering to the dynamic desires of our growing customer base of young, trendy urbanites," said Ranjit Yadav, President, Passenger Vehicle Business Unit, Tata Motors. The new EPAS system comprises of a steering column-mounted brushless motor and an ECU (Electronic Control Unit), which helps the driver steer the Nano Twist with ease, regardless of the road conditions.The brushless motor used,also improves robustness of the internal components of the Nano Twist's EPAS system. The new EPAS system also allows the driver to fully utilise the Nano's class-leading, lowest turning circle radius of 4 m. The EPAS in the Nano Twist has an 'Active Return' feature - which returns the steering wheel back to its straight-ahead position, as soon as the wheel is released. This is achieved by providing a calibrated return torque through the system. This self-centering action gives drivers confidence and stability at higher speeds thus delivering a great drive experience in city traffic. The Nano Twist is powered by a 624 cc, multi-point fuel injected, water cooled, naturally aspirated, 2-cylinder gasoline engine with 2 valves per cylinder, mated to a 4-speed manual transmission. The engine produces 38 ps power, 51 nm torque. The Nano continues to remain as the most fuel efficient petrol car, as the Nano range offers a fuel efficiency of 25.4 kmpl, as certified by the Automotive Research Association of India (ARAI). Nano Twist has been updated with more trendy features. A new look instrument cluster, now houses a trip computer and a new driver information systems, with a bright daytime and night-time Amber display and digital clock. The cluster houses new features - Distance To Empty (DTE), Average Fuel Efficiency (AFE) readouts, an LED fuel gauge and a coolant temperature gauge. The Nano Twist is also loaded with features like remote keyless entry, twin glove boxes, and a four-speaker AmphiStream music system with Bluetooth, USB and auxiliary connectivity. All these features ensure the customer is well connected with the car at all times. Twist comes with new design elements which further accentuates the brand's uniqueness. A new gearshift console ensures better accessibility to the power assist driver and passenger window switches. New seat and door pad upholstery,with new and luxurious beige interior fabrics anda new rear parcel shelf with speakers, adds to the awesomeness of the new Nano Twist. A dash of black to the rear bumpers, with a newly designed air extractor grill, apart from the new look C-pillar trim, further adds to the look of the new Nano Twist. Available in a variety of colours - damson purple (new), pearl white, royal gold, papaya orange, meteor silver and dazzle blue, the new Nano Twist will be available in the XT version, which replaces the previous top of the line LX version of the Nano range. All XT versions come with Beige interior with the exception of dazzle blue, which comes with sporty black interiors. NanoTwist XT is priced at Rs. 2.36 lakh (ex-showroom Delhi).